Dolci Domeniche D'Avvento [H1207] - $17.10 : Yarn Tree, Your wholesale source for cross stitch supplies. Cross stitch pattern by Cuore e Batticuore. 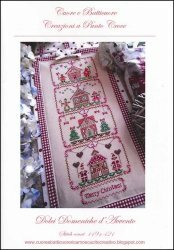 This Christmas pattern features gingerbread men and houses accented by Christmas trees, peppermints, other candies, and the words "Merry Christmas." Translated means "Sweet Sunday of Advent." Stitch count 149 x 421. Stitched on #4221 Edinburgh Linen white.